How To Make A Dementor! 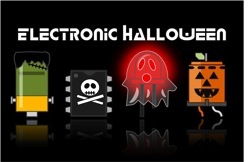 #ElectronicHalloween « Adafruit Industries – Makers, hackers, artists, designers and engineers! Dementors are among the foulest creatures that walk this earth. They infest the darkest, filthiest places, they glory in decay and despair, they drain peace, hope, and happiness out of the air around them. Even Muggles feel their presence, though they can’t see them. Get too near a Dementor and every good feeling, every happy memory will be sucked out of you. If it can, the Dementor will feed on you long enough to reduce you to something like itself — soul-less and evil. You’ll be left with nothing but the worst experiences of your life. Great project build from Pins and Things.